Sometimes it gets to be more than a bit too much. Every single day I open my Facebook page and see at least one and often more than one brand new flattering photo of one or more social media friends posted on their account. Not to mention dozens of ubiquitous (and aptly named) “selfies.” And often, new flattering self-images are posted more than once a week. I’m not talking about vacation or family photos. I’m talking about the “selfie:” a solo shot of the person doing…nothing, just looking fabulous. Taken by themselves. Or even shots taken by others. Don’t get me wrong: I love seeing a new profile photo every once in a while, and I love seeing my friends doing fun things. Like kayaking with their dogs, baking with their grandkids, holding a newly-published book. But so many portrait and self-portrait photos? Not so interesting. “Here I am in the most flattering light possible!” some of the scream, while others display the poster in a variety of situations: drunk, half asleep, breasts hanging out, (and my favorite:) in a MIRROR—as if we are all anxious to see their every moment of their lives documented. Plus, as I’ve written before, more image management goes on via social media than we might like to think. 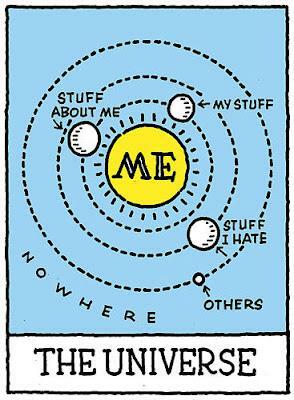 Does it all seem a little….narcissistic….to you, too? Yep, lots of self-obsessed behavior on social media. I can only wonder what this might mean for society in the future. Imagine an entire world made up of self-obsessed adults. You think I’m crabby? ROTFL. Laura! Even the term ‘selfie’ is appalling to me. I’ve never enjoyed taking photos of myself so it’s not something you’ll see me doing. What many of these adults don’t understand is the staying power of this self-portrayal. Long after they’re past that phase those photos will linger. Glad you added the bit about middle aged adults because it’s not just the teens who flaunt themselves! As for the mirror “portrait”–I used to see many of them in the profiles of over 50 men on dating sites. Creepy! Yes, exactly. I see a lot of “image management” among our cohort. It makes me laugh, but really, our concern should be this self-obsession and its impact on kids who grow up with it. 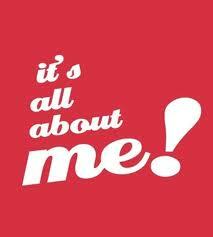 My definition of narcissistic: Enough about me, what do YOU think of me? That’s funny. For years my ex and I would say “enough about me, let’s talk about me’ in referring to certain self-centered friends! Same thing. Selfies are okay, by me anyway, if they are just your profile shot and look like you. I, too, have ‘friends’ who post several new shots each month and obviously are looking for the ‘beautiful girl (handsome guy’ remarks for doing so and I never comment unless they really are displaying a GREAT and improved shot of themselves. Changing your profile picture does not have to be displayed on your page, yet most people who change often, display every single one! You have the option to show only to yourself. Choose that! But for the kids, I do think it will change relationships down the road. I think friends will be made in a whole new and different way and it could be good or not so much. Social media does allow us to make connections based on intellect and mutual loves or interests before actually meeting and I think that can be good. But nothing will ever replace a real life hug, a real life conversation or a real life friend. Nothing says they can’t start as FB Friends or twitter friends, several of mine have. Ah, yes, the “fishing for compliments” portrait. I know it well! As far as kids go, i’m not so much concerned about how they make friends, the mechanism by which it happens, since I’ve also made friends online & via social media. More concerned about the narcissistic tendencies social media seem to promote and what kind of adults will result. Well, yes, there is that, for sure! Totally agree! I find the behavior bizarre and foreign. I recall watching a girl take selfies outside one evening, over and over and over. My first thought was that these camera phones are creating a bunch of narcissists. But, you’re right…it’s the web, because to be someone, you must be online. And any publicity is better than no publicity.